Bullion coins are some of the most sought-after coins in the world, often selling out and causing stock shortages at major national mints. So what do you get for your money? And why should you buy one? Well the key reason most people purchase a bullion coin is the precious metal content. For example, the UK £2 Britannia coin contains an ounce of pure 999/1000 silver. Soon enough one coin turns into many and you can find yourself owning a sizeable amount of silver. But these coins are not just lumps of metal. The silver Britannia is also a real piece of craftsmanship, with a beautifully evocative design struck with all the expertise of the Royal Mint. Combine this craftsmanship with the silver content and you start to see just why this coin is so collectable. But why is this any different from a silver bar, or a silver round? UK bullion coins carry the authority and security of being a government issued coin. There is never any debate about their purity or integrity. In fact they are checked every year at a 734 year old ceremony called the Trial of the Pyx. You can buy one safely in the knowledge that you are getting what you pay for. This also explains why bullion coins sometimes appear to have a ‘misleading’ face value. The Britannia is a £2 coin, but the silver content is worth much more than that. The truth is the face value is really there to legitimise the coin and prove that it is an official state-authorised issue. 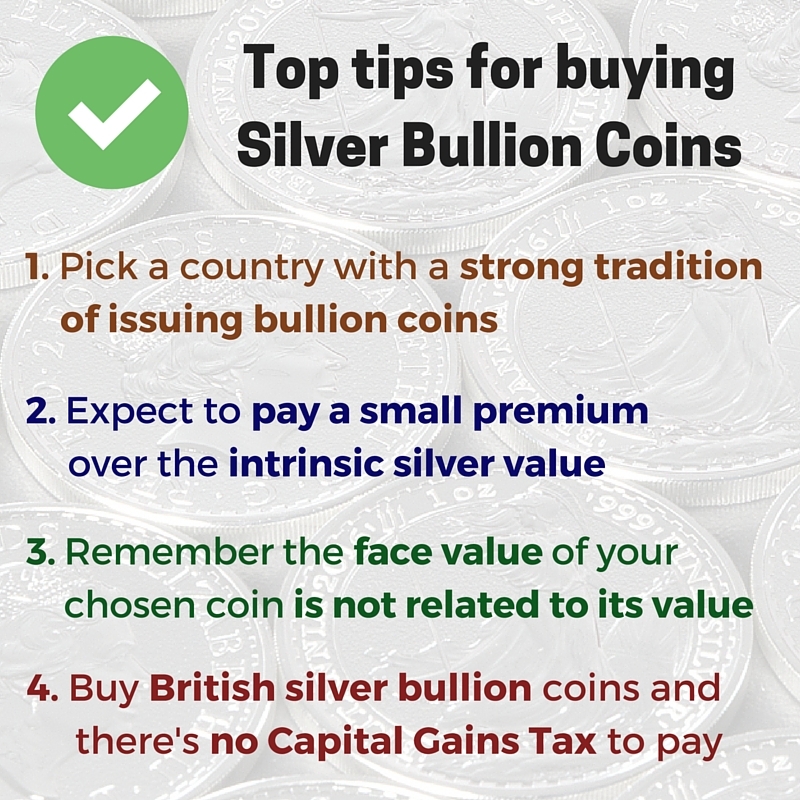 And legal tender British bullion coins have a final bonus – they will never incur any Capital Gains Tax. This makes them the perfect way to pass down silver through the generations. But you will have to pay VAT. And as with any struck coin, you will have to pay a small premium over the raw metal value to cover production costs. At the time of writing, raw silver is trading at around £10.50 an ounce, but you’d be hard pressed to find a way of buying a single ounce at that price. Bullion coins facilitate an easy entry into the world of owning silver and coins. They are not about face value or edition limit, but you can still have the satisfaction of securing a collection of genuine, bona fide UK coins – at as close to the raw silver price as you are likely to get. Though the term traditionally stands for silver bars, silver bullion can refer to both bullion bars and bullion coins. Often regulated by legislations or market bodies, the value of a bullion bar or coin depends mainly on the content of its precious metals, as a comparison of the total weight of a coin or bar and its purity.